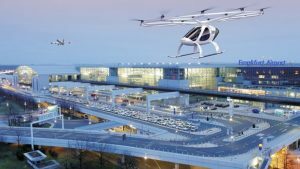 Fraport AG and Volocopter GmbH have teamed up to develop ground infrastructure and operations required for air taxi services at airports. According to a Volocopter press release, the collaboration will ensure smooth passenger handling and efficient integration of air taxis into existing transport infrastructure. The air taxi concepts will be examined using a so-called Volocopter Port. These ports will link existing urban transportation junctions with one another and provide connections to and from Frankfurt Airport (FRA). Fraport’s expertise lies in overseeing airport operations particularly in ground infrastructure, ground handling, and terminal and passenger services. The company has already tested various scenarios for using drones for operational purposes under its FraDrones program. Volocopter is known for its electrically-powered vertical take-off multicopters that have met the requirements of Urban Aerial Mobility in various test flights, most notably in Dubai. Based on drone technology, the Volocopter offers space for two people and is a suitable urban transport solution thanks to its quiet and zero-emissions flying. Both Volocopter and Fraport contend that Frankfurt Airport – Germany’s most important aviation hub with more than 69.5 million passengers last year – offers the ideal conditions for this innovative partnership. “Autonomous flying will fundamentally change aviation in the years to come. We want to be the first airport in Europe to harness the potential of electric air taxis in partnership with pioneer Volocopter – for the benefit of our passengers and the Frankfurt/Rhine-Main region. This partnership underscores Fraport AG’s role as a key driver of innovation in diverse fields,” remarked Fraport AG’s COO Anke Giesen. “Providing the ideal connection between the city center and the airport poses a huge challenge for the world’s major cities. Together with Fraport AG, we are excited to pioneer the implementation of an air taxi service at one of Europe’s most important airports,” intoned Volocopter CEO Florian Reuter.